Homaloptera van Hasselt 1823 as treated historically exhibits substantial morphological diversity and is paraphyletic based on both morphological and molecular data. The morphological diversity and phylogenetic relationships of Homaloptera, Homalopteroides Fowler 1905, Homalopterula Fowler 1940, and Balitoropsis Smith 1945, are elucidated. Pseudohomaloptera Silas 1953 is removed from the synonymy of Homaloptera. Homalopteroidini is created for the monophyly of Homalopteroides and Homalopterula; it is the sister group to balitorini Swainson 1839. Ghatsa n. gen. is created for species previously assigned to Homaloptera from the Western Ghats of India, and a redescription of Ghatsa montana (Herre 1945) is provided. FIGURE 3. Lateral views of living (A) Homaloptera orthogoniata, not cataloged, Kalimantan, Borneo, Indonesia. Strong reddish tints on body likely breeding colors; (B) Homalopteroides smithi, UF 235740, 45.0 mm SL, Khlong Tasae, Salui Subdistrict, Chumphon, Thailand; (C) Homalopterula cf. ripleyi, not cataloged, Sumatra, Indonesia; (D) Balitoropsis zollingeri, not cataloged, Kalimantan, Borneo, Indonesia; (E) Pseudohomaloptera leonardi, UF 235735, 34.2 mm SL, Ta Pi River, Nakhon Si Thammarat, Thailand. Photos (A) & (D) by Renny Hadiaty. Photo (C) by Daniel Lumbantobing. 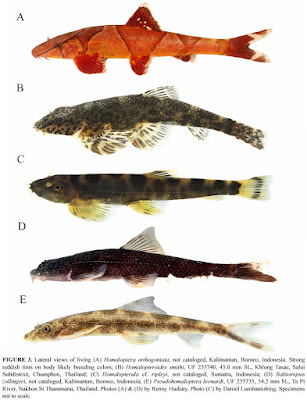 Specimens not to scale. Randall, Zachary S. & Lawrence M. Page. 2015. 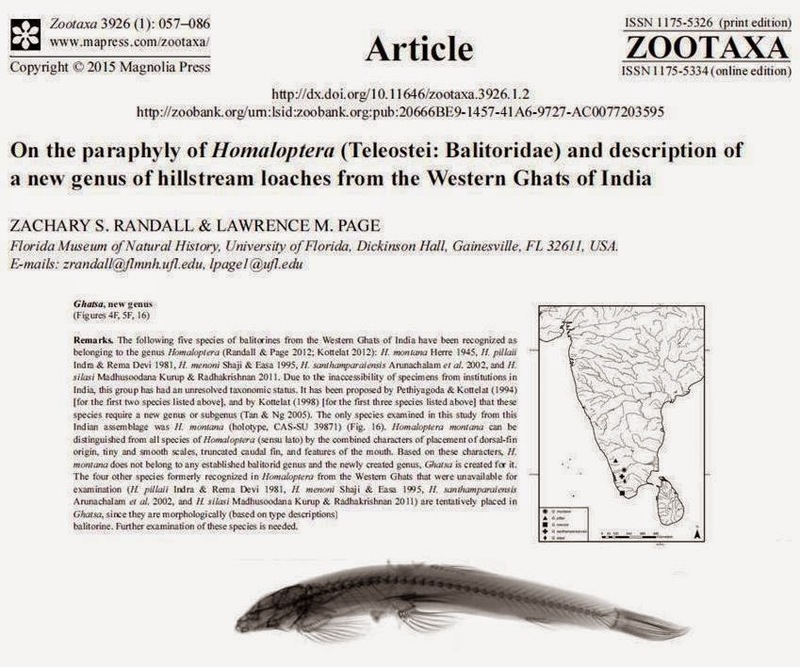 On the Paraphyly of Homaloptera (Teleostei: Balitoridae) and Description of A New Genus of Hillstream Loaches from the Western Ghats of India.